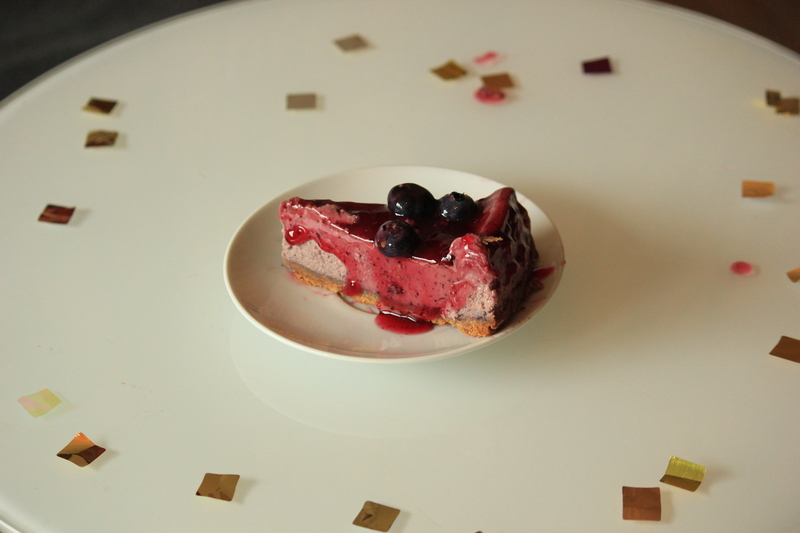 Blueberry Cheese cake – Eat, Click, Travel and Repeat! I tried out the recipe created by the chefs at Café & Restaurant Kärnhuset; Mattias Skoglund and Madléne Mannson. This recipe is available on this link. I did not find the exact ingredients from this recipe and I replaced them with similar products from other companies. First the base of the cheesecake is made using Marie Digestive biscuits (10-15 biscuits) and a half stick of unsalted butter (almost 60gr). Melt the butter and mix it with the ground biscuit. Pat down the mixture on the removable bottom of the springform cake tin cake set. Bake in the oven at 150 degrees for 10 minutes. 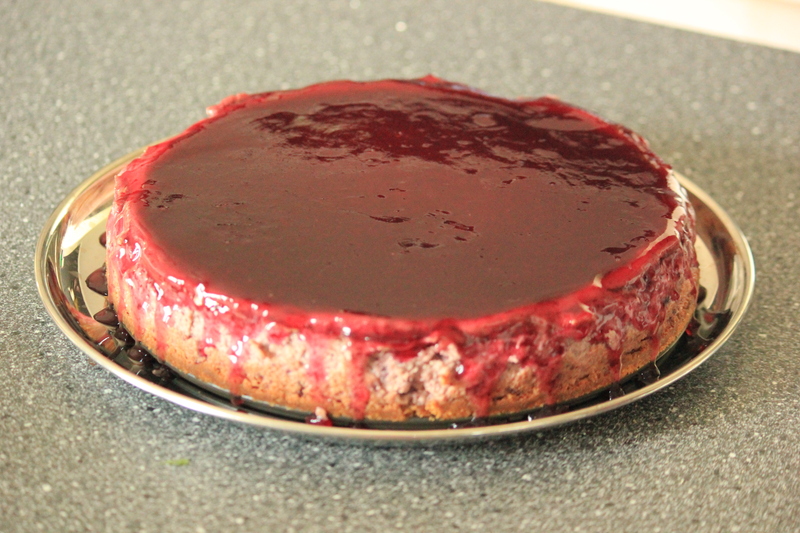 The colour of the base turns light brown in colour after baking. Next step is to make the filling. Take a very large bowl and mix together creme fraiche and cream cheese. I used natural cream cheese. I used a blender to blend this creme fraiche-cheese mixture with 1 whole jar of blueberry jam, half cup sugar, 4tbsps cornstarch, salt and 4 eggs. After blending the mixture is absolutely uniform and beautiful violet colour. Once the base cools, pour the mixture into the mould on top of it. Bake it in the oven for about an hour. I removed it from the oven only when I was convinced that the toothpick came out clean when pricked in the cake. After the cake came to room temperature, I transferred the cake to refrigerator and let it cool overnight. I should mention that the top of the cake was completely brown and cooked. I did not cut off the top of the cake even the next day, I let the brown part stay. 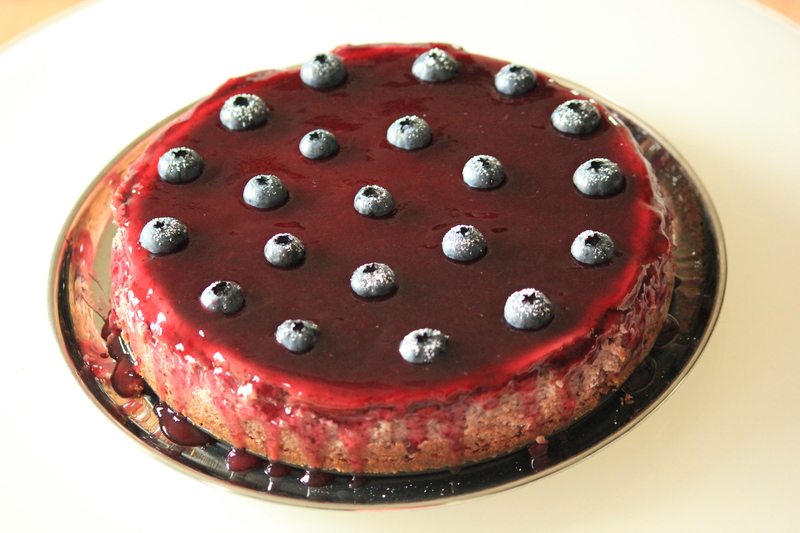 I decorated the cake with fresh blueberries and sprinkled it with icing sugar. Let me assure you the cake was delicious. It was a birthday cake for my husband and he was absolutely pleased 🙂 Yay ! my first cheesecake was a hit.